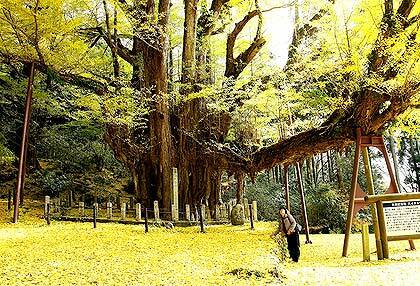 The enormous Bodaiji Ginkgo tree is situated on the mountain side of Nagi National Park on the grounds of temple Bodaiji. It is a natural monument and a symbol of Okayama in Japan. Legend has it that the Buddhist reformer Hōnen planted this tree in the first half of the 12th century when he began his initiation as a monk. The tree is said to have sprouted from a staff he stuck in the ground. During the Edo period (1603–1868) a heavy snowfall bowed a large branch to the ground, allowing chichi to take root and eventually form a new trunk. It is now c. 40 m tall, 13 m wide and has many aerial roots (chichi). 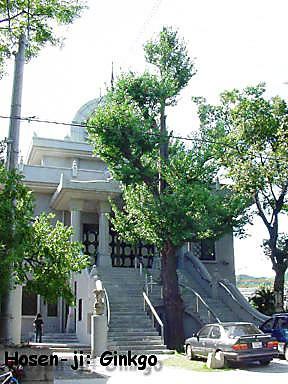 Location: 1532 Kōen, Nagi, Katsuta-gun, Okayama Prefecture, 708-1307. Video by NHK Okayama Video Club on YouTube. Video by Re&Lin 8m2-film on YouTube. More: Another video taken by a drone on YouTube.